Every year millions of units of blood are donated globally, since blood and its components play a major role during the diagnosis and treatment procedures. It is used in necessary transplantation, cancer therapies, and accident victims and for patients undergoing other forms of surgeries. Blood transfusions consume majority of blood donated worldwide. Blood used should be of required quality and to ensure that blood processing is the key aspect. Blood processing includes blood, collecting, storing, and managing after it is donated by donor. Globally, increasing government initiatives, and rise in the demand for blood and blood components are the prime growth drivers of blood collection tubes market. In addition, increasing number of complex surgeries in emerging economies, and rise in aging population and prevalence of diseases, will create new opportunities for blood collection Tubes market. However, higher cost of the research and development, is the key restraint for blood collection tubes market. This report identifies the global blood collection Tubes market size in for the year 2014-2016, and forecast of the same for year 2021. 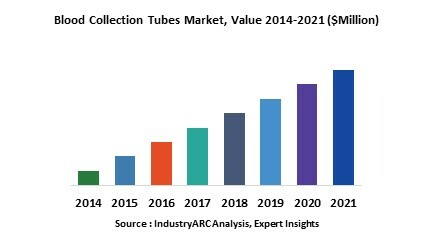 It also highlights the potential growth opportunities in the coming years, while also reviewing the market drivers, restraints, growth indicators, challenges, market dynamics, competitive landscape, and other key aspects with respect to global blood collection tubes market. Geographically North America dominated blood collection tubes market, due to around 18 million units of blood is transfused for the treatment of various hematologic diseases such as leukemia, anemia and sickle cell diseases. Asia Pacific is projected to have fastest growth, owing to rapidly increasing aging population, and modernizing healthcare infrastructure in this region.